Horse Whiskers: What Are They, And What Do They Do? Horses have marvelous, almost magical hairs called whiskers. Even though whiskers are a type of hair, they're different and far more specialized than the other hairs on a horse's body. You might even say that being a whisker hair is a kind of super power. If you've ever been curious about your horse's whiskers, read on for all about what they are and what they do. Below: The muzzle (nose and lips) whiskers on a horse. Whiskers are a sensory organ in the form of specialized hairs found on many kinds of mammals. Whiskered mammals include dogs, cats, horses, and more. On the outside we can see that whiskers are longer, stiffer, and bigger around than typical hairs. Their real importance, though, is contained in what we can't see beneath the skin: Whisker follicles are deeper and larger than other hair follicles, with a richer blood supply and a connection to far more nerves than regular hairs. This helps make whiskers incredibly sensitive to touch, event if it's something as subtle as gentle air movements. In addition to being super sensitive, when stimulated each whisker sends a unique, identifiable signal to the brain. Each signal is then processed and an appropriate response - voluntary or automatic - is carried out. Whiskers are officially called “vibrissae” which means...wait for it...whisker. A whisker can also be called a "tactile hair" or "tactile vibrissae." Horses have whiskers on their face around their eyes and muzzle (nose and lips). In these locations whiskers use their superpowers not only to help protect delicate tissue, but also to help compensate for the blind spots a horse has in front of its face and underneath its nose. In fact, many times the only information a horse receives about what's happening in these areas is information provided through its whiskers. While lots of mammals also have facial whiskers, some mammals have them in other places, too. For example, cats have facial whiskers like horses, but they also have whiskers (called "carpal" whiskers) low on the back of each front leg. Below: The whiskers around a horse's eye. 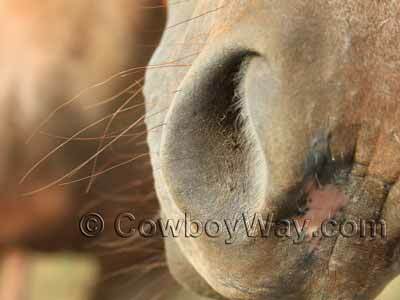 Below: The whiskers on a horse's muzzle (nose and lips). 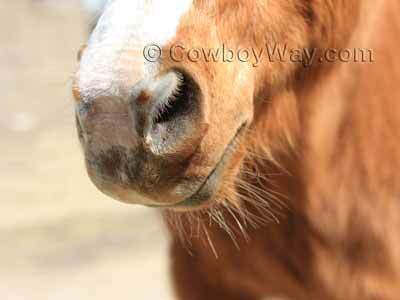 Whiskers are sensory organs that help our horses experience, explore, understand, and react to the world around them. As we've already mentioned they are highly sensitive and, when stimulated, each whisker sends a unique, identifiable signal to the brain. Whiskers help protect delicate body tissues. For example, a horse's eye whiskers can cause an automatic blink to help protect the eyes. The muzzle area is delicate, too, and muzzle whiskers feel their way through the world to help a horse keep its nose, lips, and face out of trouble. When eating, whiskers help a horse find and evaluate food. A horse bases many decisions on what to eat and what to avoid based on whisker input. This is true of a horse while it's grazing or eating out of a hay net, bucket, or feeder. When evaluating an object a horse's whiskers can help discern distance, texture, temperature, shape, and movement. It's likely that whiskers play a role in social interaction with other horses. Exactly how and to what degree, as far as we know, hasn't been clinically studied. However, when horses interact or explore one another with their whiskers, their actions and reactions suggest that whisker feedback contributes to their responses. Whiskers can work in conjunction with a horse's other senses. Consider that the next time your horse sniffs you, a friend, another horse, or pretty much anything else: While it might be tempting to think they're only gaining information through scent, they might very well be gathering information through their whiskers, too. 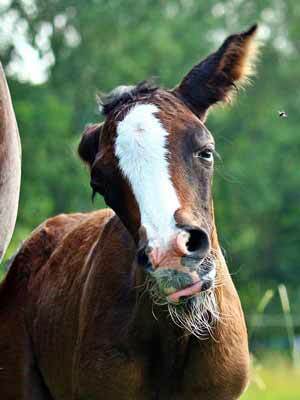 Newborn foals are typically born with more and longer whiskers than adult horses. While sometimes comical looking, it's believed that this generous supply of whiskers helps them with the critical task of finding their mother's teats. Below: A foal shakes its head while showing of the long, plentiful whiskers on its muzzle. 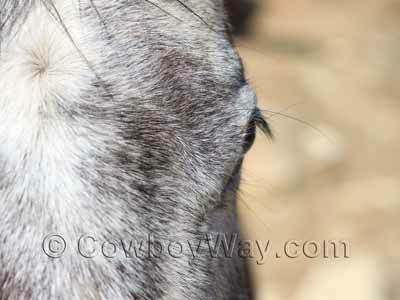 Should You Trim Your Horse's Whiskers? While it doesn't seem to cause a horse pain to trim its whiskers many of them clearly don't tolerate it well. With some horses, what used to be thought of as being impatient or unhappy with a whisker trim can now be better understood as a horse - at least in some cases - who is genuinely uncomfortable when having such a sensitive tool nipped, snipped, or shaved. While a horse may or may not be uncomfortable during a whisker trim, it's a given that trimming them will deprive a horse of the sensory information they provide. Whether or not the lack of this information causes a horse confusion, stress, or a greater likelihood for injury, to the best of our knowledge, has not been tested in a well-known clinical study. However, once we begin to try and understand the constant supply of varying types of information whiskers provide to our horses it seems there can be little question that they are better off with them than without them. We are sympathetic that in some cases where horses are shown competitively a horse that hasn't had its whiskers shaved might be considered poorly groomed. Maybe it's time we try to change the notion that exists in some circles that whiskers aren't attractive on an otherwise nicely presented horse. If we can learn to appreciate them for the tactile marvels that they are, whiskers should look pretty handsome to all of us. By the way, in the interest of full disclosure we will mention that here at CowboyWay.com we used to regularly trim our horses' whiskers. At the time we were under the impression that it was simply part of good grooming. Over time, though, we began to appreciate the constant influx of information whiskers provide to a horse and we stopped trimming them years ago. Whiskers are the first type of hair to form during embryonic development. Whiskers shed. While they don't follow seasonal patterns like most of the hairs on our horses bodies, they do have a growth cycle where they emerge, mature, and after a time naturally shed to be replaced by new ones. Some researchers speculate that horses and other whisker-bearing animals can pick up on vibrational energy through their whiskers. This might help them detect sound frequencies through their whiskers, or feel the energy in an electric fence without touching it. People don't have whiskers. Sure, people have facial hairs we call whiskers, but they're not true whiskers. Other primates have whiskers (such as monkeys, chimpanzees, gorillas, lemurs, and others) but not human primates. 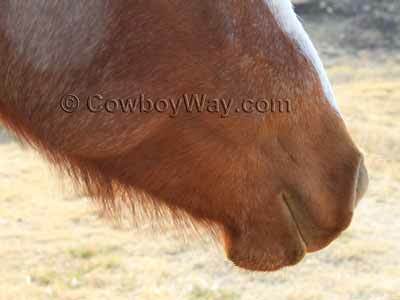 Below: Long winter hairs on the lower jaw of a mare.